Richmond, VA-- Separated by 100 years of time and place, you might not at first see any connection between James O'Barr and Edgar Allan Poe...but it's there. Even if you distill it down to just the fact that one created "The Raven," the other created "The Crow." Both iconic works using these avian symbols as metaphors for something far more deeper, darker and richer than one realizes until the stories take flight, transcending the mediums of their own times with creations that indeed took on a life of their own. 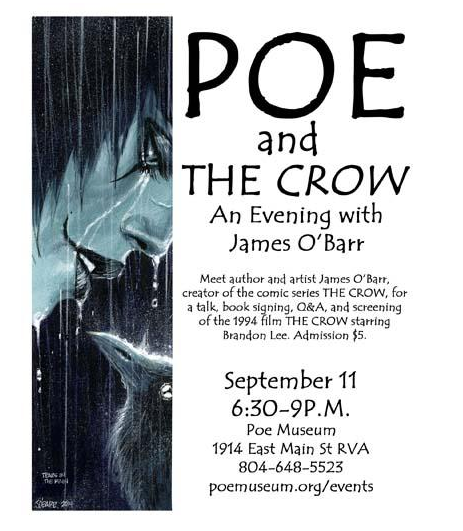 For one night in Richmond, Virginia, these two creators-- will converge-- Poe in spirit, and Mr. O'Barr in the flesh-- with "Poe and The Crow: An Evening with James O'Barr," beginning at 6:30 in the evening with a signing and Q and A, and ending with a screening of "The Crow" starring Brandon Lee-- An appropriate look back, with a new Crow movie currently in pre-produciton. O'Barr's visit to the Poe Museum coincides nicely with the facilities current exhibition, "The Living Poe," which deals with Poe in popular culture. In recent months, they have had a series of speakers on the topic of Poe's continuing influence on today's arts and culture, and his influence on the modern horror genre. In October, they'll host Vincent Price's daughter Victoria Price, who will share her experiences with her father and his love of Poe. 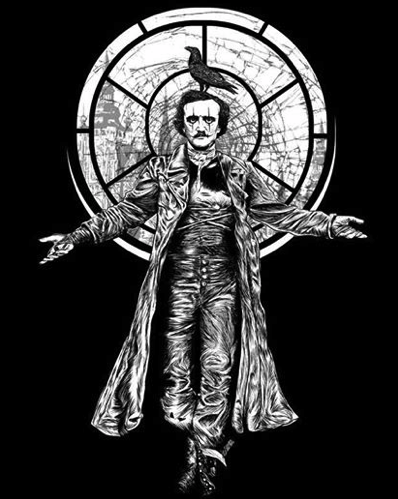 And while O'Barr and Mr. Poe are vastly different in their approaches and influences, this evening continues an homage from other creators, be they writers, actors or artists, who strive in the creative process and respect the works of Edgar Allan Poe. In addition to creating one of the best selling graphic novels of all time, James O'Barr is also the writer of several current hit series, including "Curare," "Skinning the Wolves" and "Pestilence." While also serving as a consultant on the upcoming Crow movie. His recent artbook "James O'Barr Uncoffined" has already sold out, and a new book is in the works. During the evening at the museum, James will be signing prints, available at the venue, and talking before the screening of "The Crow." While there, attendees are also encouraged to look over the Poe Museums vast collection of rare artifacts and manuscripts relating to Poe, all housed in a historic building with direct connections to the writer. For more information on the Poe Museum, this event and others go to: poemuseum.org. "Michael Golden: Dangerous Curves" to Debut at Wizard Chicago! Chicago-- Fresh off the presses, the new hardcover, deluxe format, full color sketchbook by Michael Golden will debut at the upcoming Wizard World Chicago show, Aug. 21-24, at his table in the Featured Artist section of this year's show. "Michel Golden: Dangerous Curves" is a lush book, at 48 pages, full of powerful pieces by this renowned artist and storyteller. But why call it "Dangerous Curves?" Because the name is multi-layered. Golden is known for his strong female characters with their piercing eyes (and yes, curves). And indeed, Michael always says that the first thing he draws for any female character IS the eyes--the window to the soul. And each of Golden's women express their own strength and individuality on every page, drawn in an authentic and complimentary style. 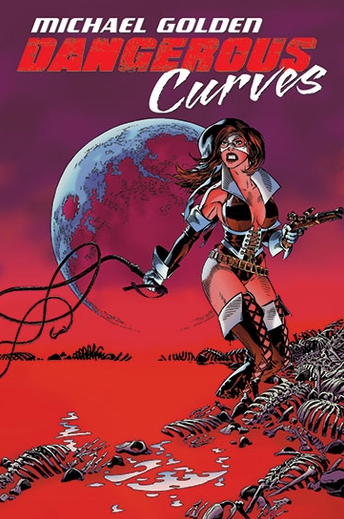 But "Dangerous Curves" also features other characters--those that lurk around the corner as well as those that seek adventure--providing a good sampling of familiar characters, human and otherwise, providing the drama and/or confronting it. Being the master storyteller that Michael is, known for his work on "G.I. Joe," "Spawn," "Bucky O'Hare," "The 'Nam" and much more, of course each piece in this book tells a story of it's own on each page, with a solid and substantial art style that roots them firmly in your imagination. In addition to the new book making it's debut at the show, with the artist in attendance to sign it, all VIP packages for the show will include a free Michael Golden poster in a limited edition. Ask for details on the Wizard World convention website!